This is a new family favorite in my house, even the people who don’t like coffee love this desert. The cake is made with freshly brewed coffee (I used an English Toffee blend, feel free to use whatever you like), chopped up almonds (hazelnuts are great in this too), and a crispy brown sugar crumble with a hint of cinnamon. 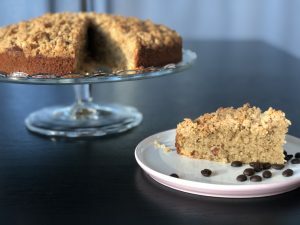 Crumb cake is my favorite kind of fall dessert to have with coffee and tea, I’m sure you will enjoy this recipe, even before you take it out of the oven the baking aroma is sublime. *I like to use a more coarse and crunchy brown sugar like demerara sugar it gives the crumble a more crispy and better texture. Preheat the oven to 350ºF (180ºC), no fan/ventilator. Butter a 10 inch (25cm) springform pan and line it with parchment paper on the bottom. In a large bowl add the butter, sugar, vanilla, and salt; whisk until smooth. Add in your eggs and whisk those until smooth as well. Sift in your baking powder and half of the flour into your batter, whisk until completely combined. Add in all of the brewed coffee, whisk until combined then sift in the rest of your flour and whisk just until that is completely incorporated into the dough. Finally fold in your chopped almonds. Pour the batter into your prepared pan and level out with the spatula to make it even. Put in the fridge while you prepare the crumble topping. In the same bowl you mixed your batter in, add the softened butter, sugar, cinnamon ,and salt. Mix those with your spatula until they are completely combined, then add the flour in, mix until you end up with a crumbly dough. There will be a couple of big chunks and little chunks, that is perfect. Sprinkle the crumble on top of the cake batter, try to disperse it as evenly as possible. Place your cake pan onto a baking tray, place in the oven and bake for 45-50 minutes or until it is a light golden brown on top and a skewer comes out of the center clean. Allow your cake to cool just until slightly warm, then remove from the pan and serve. I like to put it on a cake stand, cover it while it’s still warm, and let it sit overnight; in my opinion it tastes the best the next day. When you cover it while it’s still a bit warm, it retains more moisture and you get a really tender cake.